In fact, our current form of toilet can be the blame for various health problems out there today such as Constipation, Hemorrhoids, Colon Cancer, Hiatal Hernia and GERD, Contamination of the Small Intestine, Gynecological Disorders including Pelvic Organ Prolapse and Uterine Fibroids, Prostate Disorders, Sexual Dysfunction, and many more. It is in fact also potentially problematic for pregnancy and childbirth. It is kind of unfortunate, I feel, when I read this! Do you think we can ever go back to the old days? Would our society allow it? And can we actually get back to the squatting position? 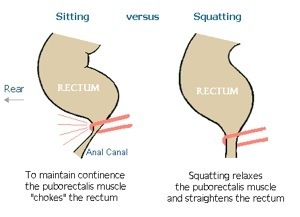 In fact, do you actually have the strength to do it or have Your legs become so unable to perform such a squatting position for a period of time? I speak of experience when I do squats for a workout and it is quite difficult!